It is called motor end plate which is defined as specialized junction between terminal end of one of the divisions of axon of a motor neuron (neural element) and a skeletal muscle fiber (muscular element). A motor nerve enters inside a skeletal muscle along with its blood vessels for innervation through a point called neurovascular hilum. 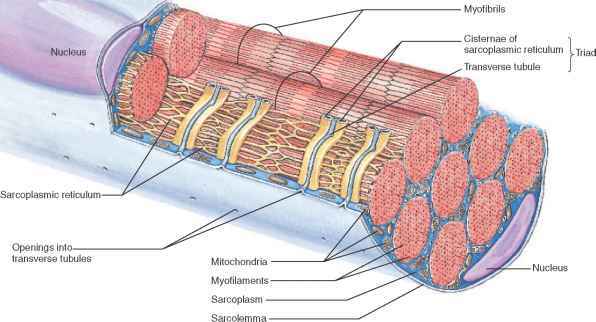 Inside the muscle, the nerve divides further into number of axons. One axonal process divides into number of branches. Each of these branches of axon presents a terminal knoblike endings (telodendria). This terminal swelling comes in contact with a gutter or depression on middle of surface of a single muscle fiber (myocyte).This junctional area is called motor end plate (neuromuscular junction or myoneural junction). Motor end plate presents structural characteristics similar to that of a typical synaptic junction between two neurons. Structure of motor end plate shows following 3 components. Neural element: It is the terminal, nonmyelinated, swollen end of the division of axon of motor neuron (Telodendria). It is called synaptic knob. Muscular element: It is the central, raised surface of a muscle fiber with a gutter which comes in contact with synaptic knob. This is called sole plate. Large number of electron-dense, membrane bound vesicles called presynaptic vesicles. These vesicles are filled with Acetylcholine which acts as neurotransmitters. At the site of motor end plate, sole plate is characterized by a surface elevation which is at the middle of the muscle fiber. This elevation is due to condensation of sarcoplasm (cytoplasm of muscle fiber) which shows granular appearance beneath the sarcolemma (cell membrane of muscle fiber). This area also presents accumulation of more number of nuclei, mitochondria, Golgi apparatus and endoplasmic reticulum. The raised surface of sole plate presents a depression called primary cleft which is related to axon terminal. But, as already mentioned, axolemma(cell membrane of axon) at the site of axon terminal is separated by synaptic cleft from primary cleft of sole plate covered by sarcolemma. Surface of primary cleft is thrown into number of foldings to increase the surface area. These are called secondary cleft. Bottom (floor) of the secondary cleft presents specialized features called receptors. When the nerve impulse reaches axon terminal at the site of neuromuscular junction, Acetylcholine is released from presynaptic vesicles into the synaptic cleft through a process called exocytosis. Released Acetylcholine diffuses at a high speed through synaptic cleft and binds with the receptors at the secondary cleft of postsynaptic membrane of sole plate. The receptors get activated. Activation of receptors causes depolarization of postsynaptic membrane which results in muscular contraction due to generation of action potential. Contraction of a muscle fiber (so also the whole muscle) is to be followed by relaxation. This becomes possible because, as soon as depolarization occurs to cause contraction of muscle fiber, Acetylcholine is broken down (hydrolyzed) by the enzyme cholinesterase into choline and acetic acid. This enzyme is bound to both pre as well as postsynaptic membrane. Choline is reutilized back into the axoplasm for resynthesis of acetylcholine.Myoneural junction of smooth muscle This does not show classical structure of neuromuscular junction or motor end plate. Axon terminal does not come in contact with surface of muscle fiber. Rather, there is considerable gap between the two. Terminal segment of axon is nonmyelinated and may be covered by cytoplasm of Schwann cells. At the terminal end axoplasm presents vesicles containing neurotransmitter. In case of parasympathetic nerve ending neurotransmitter is acetylcholine, but incase of sympathetic it is catecholamine (usually noradrenaline). In sympathetic system, monoamine oxidase is the enzyme which destroys catecholamine. In relation to muscle fibers of gastrointestinal and urinary tract, some autonomic nerve endings release another variety of neurotransmitter called adenosine triphosphate which is inhibitory in nature.